Finally, this is the multi-panel painting I've been working on for so long. Submitted it for a Utah-wide show. We'll see whether it gets in the show. 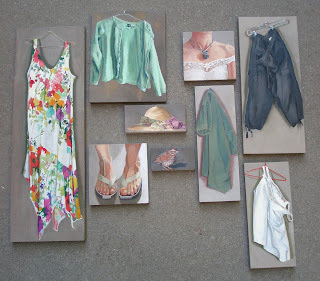 Another installment for my nine-panel painting. Within a few days I'll be able to publish the whole thing. Another panel for my multi-panel painting almost done. 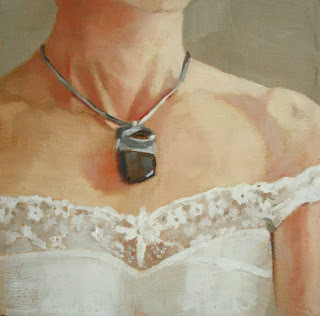 I'm feeling obliged to post paintings to my blog, even though I'm no longer on a schedule to produce daily paintings. This one reflects a second day of work on the painting. It, again, may undergo some adjustments later. I found it very hard to work with black (or, dark darks). It wasn't so much finding the variations on black that worked, but the application of the paint itself. It was very hard to paint the darkest darks into the painting without accidentally lightening them too much with the surrounding lighter shades. Every painting is another lesson learned. 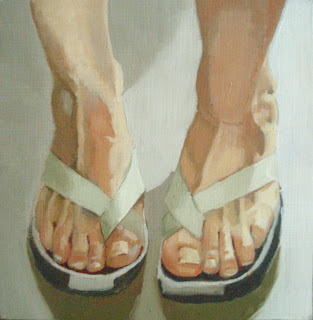 Doing "more serious" paintings, i.e. paintings that I spend more than a single day on, as with my daily paintings, is reminding me of how much I enjoy finishing off a painting. This one may not be quite done, but I've spent two days on it, now. I like the much greater control I have putting down a second layer of paint over the first one. 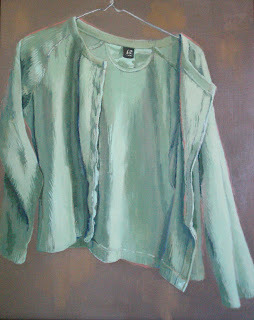 This is one of the paintings for my larger grouping of paintings (including the flowered dress and the green sweater). I wasn't happy enough to post the "second day" version of this painting. For once I was smart enough to hold off on publishing my latest effort until I had a chance to evaluate it with the benefit of time having passed. This is close to, if not, the final version. Of course, I need to see it with the other six more or less finished panels of this work to feel confident it's where I finally want it. I have until Sept. 25th to finish the whole work. I'm happier with today's effort. There are still a couple of details that need to be worked on, but this is better. Back to the dress tomorrow, or on to another of the panels.